​With all of the business men and women that travel in and out of offices in Lancaster, it's no surprise that floors take a serious beating. Lancaster's most Reliable Professional Commercial Cleaning Service can clean all floor types and makes as well as Strip, Wax, and Buff your floors to make them look brand new. Our Special Process of stripping and waxing floors in Lancaster, PA has helped hundreds of Business, Schools, Department Stores, and Financial Institutions shine for their customers and put their best foot forward. Repair for a damaged floor can be quite a challenge, especially for someone who isn't familiar with the task. Because of the difficulty, many Businesses Owners turn to Professionals in the Floor Waxing and Cleaning fields to meet their needs. Lancaster Commercial Cleaning not only provides the service of stripping, waxing, and buffing, but also provides assistance in protecting your floors from future unwanted damage. By calling the professionals at Lancaster Commercial Cleaning, you are able to focus your time on more important business matters. We pride ourselves in being Prompt and Efficient, and yet still High Quality. You don't need to be on the phone all day hunting a Quality Company, nor do you need to wait 2 weeks before you cleaning company arrives to complete the job. We are a Business too, and understand the griefs on having to wait for service. We wont leave you in the cold, or waiting; our team will be on your floors at your earliest convenience ready to complete the job for the next Business Day. 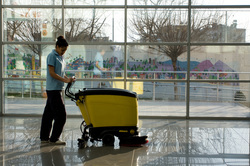 ​There are a number of cleaning services available for your business to chose; many of which are also qualified. We understand the need for competition in any market, and that is why we aim to keep our Quality High and Prices Low. Our Rates are quite Competitive in the area, and we believe are very fair for all of Pennsylvania. By hiring a Professional Cleaning Company for Stripping, Waxing, and Buffing your floors, you are saving a large amount of money on cleaning supplies that would otherwise be used by employees, potentially untrained how to properly maintain and repair damaged floors. Of course, we always recommend that, regardless of the company you choose, you request an Estimate up front. This will give you a general idea of how much can be budgeted for floor repair / cleaning. Our Estimates are Free and delivered with No Obligation. We welcome the opportunity to show you why Lancaster Commercial Cleaning Service has not only met but exceeded the expectations of clients all throughout Lancaster County. Our Floor Stripping and Waxing Services in Lancaster are second to none, so call us today at 717-983-4307 for a FREE Quote for your Floor Stripping and Waxing!